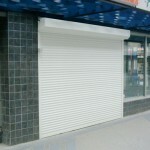 Rolling shutters provide outstanding security improvements to retail and commercial property as well as private homes. The deterrence factor is significant with roller shutters on all points of access, including windows at basement and ground level and glass doors. Any and all openings can be covered for maximum protection. Residential and holiday properties which are unoccupied for extended periods and patrolled less often are more likely to be targets of vandalism or crime. Roller shutters give you the peace of mind with significantly enhanced protection. Retail businesses with exposed glass fronts can close up after hours with the confidence of high levels of protection. Roller shutters afford a clean, professional look at night without exposing glass to vandalism and barring access to front doors. Take advantage of high traffic and high risk retail and commercial areas with the installation of roller shutters. The complete coverage of your business makes it far less a target for vandals and thieves. A variety of locking options and opening/closure solutions provide you with the type of access best suited to your installation. You may choose to have your shutters enhanced by company logos or custom artwork to profile your business, which often keeps ‘taggers’ away from defacing the property. Special resistant coatings can be applied to our shutter surfaces to make them easy to clean and resistant to graffiti.